Kid Friendly | Food E.
I won’t go into detail on this, but have you ever researched what’s inside a chicken nugget? I’ll give you this: it’s not cute. It’s barely even chicken. But who doesn’t love a nice dunkable, battered chicken strip? It’s American comfort food at its best and it is beyond easy to make. So skip the McDonald’s and try them at home. This particular recipe is SPICY so you can easily cut down on the cayenne to make it family friendly if you like. Preheat oven to 375 degrees. Spray a large baking sheet with nonstick cooking spray. In a food processor, blend pecans, bread crumbs, and spices until you have a coarse mixture. Cut chicken into strips, approximately 1 1/2 inches wide by 1 inch tall (they don’t have to be perfect but uniform size means uniform cooking). Dredge each piece of chicken in egg mixture and then in pecan spice mixture. Shake off excess and place on baking sheet. 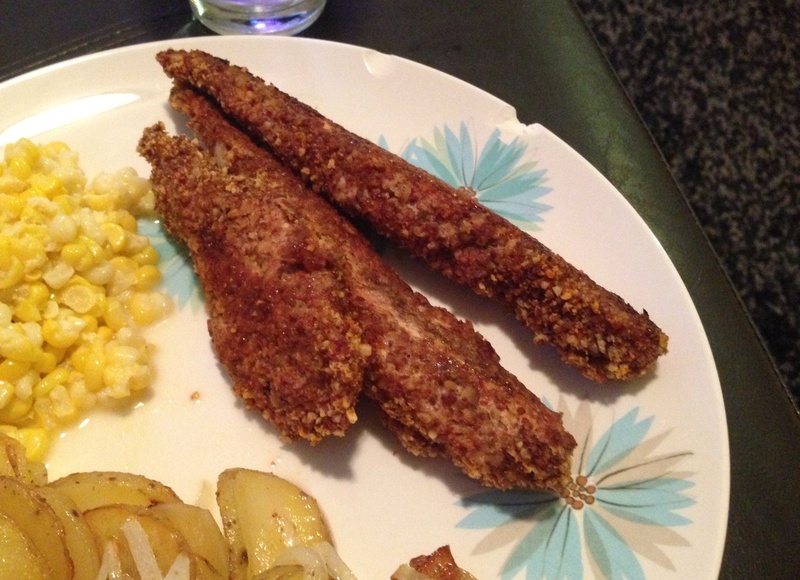 Bake chicken strips for 30 minutes. Flip the pieces and bake for another 5 – 7 minutes or until each piece is cooked through and the breading is crispy. Serve with honey mustard dipping sauce. *Note: I never, ever have breadcrumbs on hand. There’s something about buying a tub of crumbs of bread that just seems wrong to me. What I did in this instance is toast up a piece of white bread until it was very crispy, tear it up with my hands, and then toss the pieces into the food processor with the pecans and spices. Voila. Bread crumbs.